As a child, Bruce Wayne witnessed the tragic murder of his parents during a mugging turned violent. Disturbed by the injustice of their deaths, Wayne takes it upon himself to purge Gotham city of the corrupt and protect the innocent. He creates himself a second identity called Batman, an agent of order that wears darkness as comfortably as the wicked he hunts. For years fans have been asking, “what’s wrong with Batman?” Is it possible for one man to dress as a bat, battle the scum of an entire city but still be considered sane? 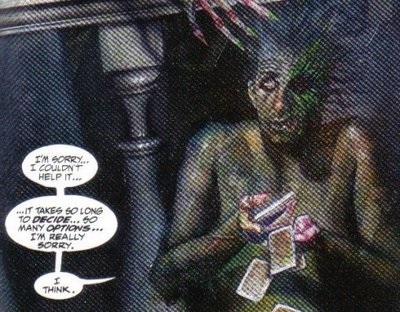 In Arkham Asylum: A Serious House on A Serious Earth, author Grant Morrison gives us a disturbing look at the rotten mental state of the Caped Crusader. A general warning: Asylum is not a comic for the faint-hearted. Unlike the usual Batman saves Gotham from [insert villain name here] story, Asylum features intense violence, suggested sexual/physical abuse, and a grim look at the human condition. Plot Summary: On the night of April Fools, the inmates of Arkham Asylum take over the ward. They call Batman and inform him that unless he comes to the Asylum they will murder the staff that they’re holding hostage. 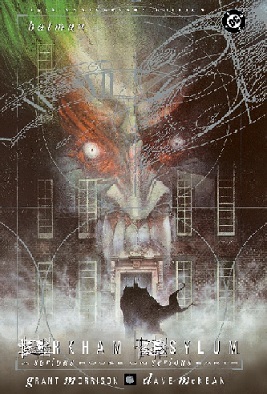 Upon arrival, Batman is chased throughout the asylum by the madmen within and haunted by the ghost of Amadeus Arkham, the asylum’s founder. splattered red (see below) is a perfect representation of insanity. Amadeus Arkham. This is easily one of the best backstories I have ever read for any character. 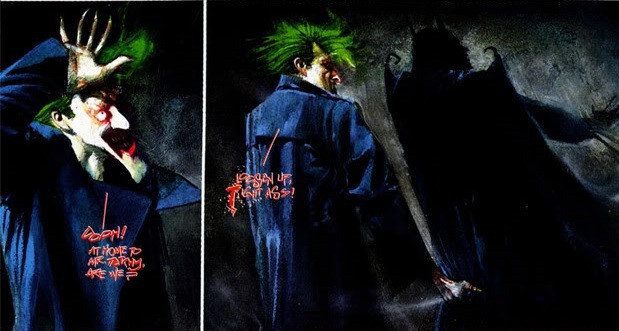 While keeping his unstated mental disorder deep within himself, Amadeus creates Arkham Asylum, a facility for the criminally insane. However he himself is thrown into his own nuthouse before long. As a reader, I felt extreme sympathy for him. He suffers loss and sexual abuse. His descent into madness is believable and haunting. Batman. Does Batman belong in the madhouse? This question haunts Batman throughout the book. In many ways he is just as mad as the rest of his foes. He is supposedly order, but stranded in a world of chaos, his order is chaotic. In this novel he is suffering from PTSD and probably split personality. Two-Face. The Harvey Dent in this graphic novel is one pitiful creature. His coin has been taken from him and replaced with a deck of tarot cards. In one scene he even wets himself because he couldn’t make the decision to use a toilet fast enough. The Art. 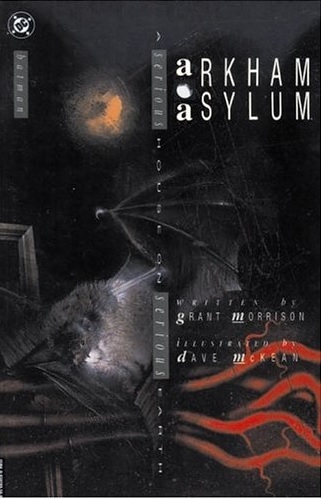 Dave McKean combines the grotesque and the beautiful in his work on Asylum. I know a lot of people disliked the surrealism, but I believe it adds to the horror aspect of the book. The Art. I understand that I just praised McKean’s work, but hear me out. Sometimes I wish that McKean could have drawn a clearer picture. I feel like a missed out on a bit of the story because I simply had no idea what was going on. It was beautiful confusion. Arkham Asylum is a classic. When I discovered that my local comic store didn’t have it, both the attendant and I stood in a stunned silence until he walked to the computer and ordered a few. I’m sure it’s written somewhere in the Bible that “comic stores must carry Arkham Asylum.” Anyways, Batman fans or not I believe that every comic fan should try this book out. It’s dark but beautiful. Please comment below. Special thanks to La Cracha for letting me create a guest post on Comics to Read! If you’re bored, check out my book review blog: Fantasy Book Reviews.